How crazy was James Cameron? 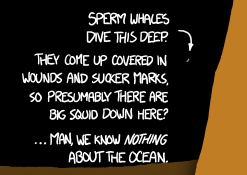 Our friends over at XKCD have brought out yet another informative web comic, this time focusing in on the depth of the Earth's oceans and lakes (among other things). Zoom in and take a look, it's really great. This type of visual would be really simple to re-create (by you or students)... you could use paper and markers, construction paper, or PowerPoint. 1. Informative - The best visuals help me understand something better. They are (mostly) self-explanatory and can break down a complex concept into something my pea brain can work with... even (maybe especially) if I don't really care about the content. 3. Interesting - The topic can and should be interesting, but a few random bits of trivia in the mix can help spice it up. In the visual above I learned that Emperor Penguins can dive really, really deep... crazy deep (although I still don't know why they do that), the Deepwater Horizon is also crazy deep, and that the Dead Sea is an amazing distance below sea level. 4. Data Visualizations - There are loads of lame, text heavy infographics out there... making it pretty with pictures really doesn't change the fact that I don't need an infographic representation of "iPads vs. Textbooks" to help me understand the issues. Also, I hate scrolling down 10 pages with these...* the best visuals represent data and help me identify trends in that data. 5. Creative - I appreciate good design, but I'll take a creative visual over a well designed one any day of the week. 6. Humorous - I like visuals that make me chuckle. I think they should (if appropriate) contain an element of humor. Not forced humor, but creative, suble humor. 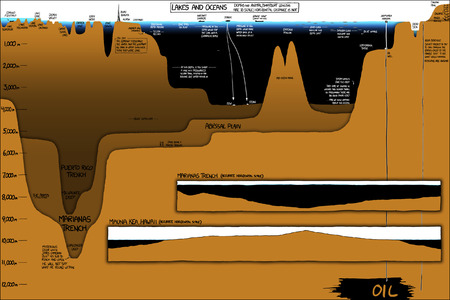 In the "Lakes & Oceans" visual above you can find some (of course, it's XKCD so that's expected). I think humor can make the visual more memorable as well. 7. Offering something new - Due to James Cameron's historic dive to the Marianas Trench, there have been tons of visuals illustrating just how deep it is "down there". All of these visuals look basically the same and show the trench as a steep, deep gash in the ocean floor. This is the first visual I've seen that offered the Horizontal Scale... not only valuable information, but something I'd never seen before. 8. Not overwhelming - Too much is too much. The best visuals have enough to keep me entertained and educated but don't get carried away. I'm sure you've encountered examples of what I'm talking about. 9. Relevant - I guess this is relative, but one of the reasons this "Lakes and Oceans" visual works is because James Cameron just went down there and its all fresh in our heads. BTW, if anyone can explain this to me, that would be great! April 13, 2012 by Brett Sparrgrove.